Hunger is a problem that has plagued humanity for millennia, and it continues to haunt us. 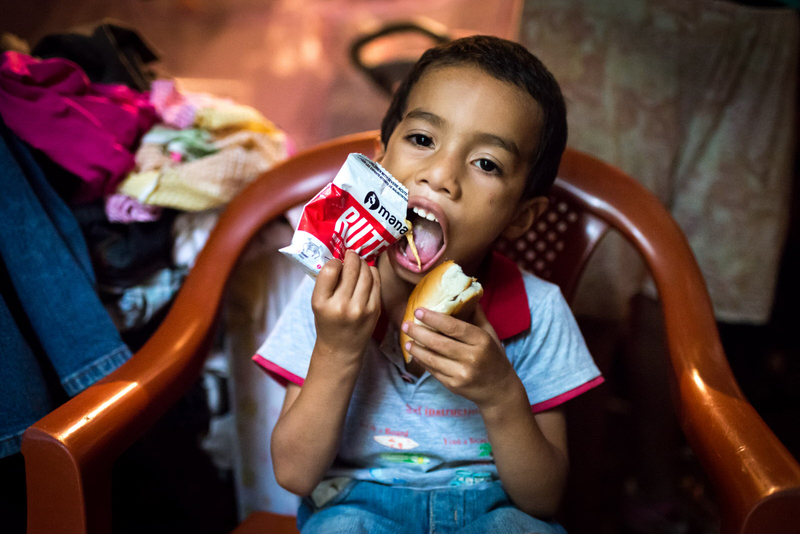 Hunger is the world’s leading health risk, with one in three people worldwide suffering some form of malnutrition, according to the World Food Program. Every six seconds, a child under 5 dies of hunger-related causes, and one in eight people in the developing world go to bed hungry each night. Just because hunger has persisted doesn’t mean it has escaped God’s notice: “God always keeps his word. He gives justice to the poor and food to the hungry,” (Psalm 146:6-7, CEV). His expectations of His people haven’t changed, either. When God gave Moses the law for His people, one was to let some crops stay in the fields so the poor could glean them for their families (Leviticus 19:9-10). Every year we recognize the struggle against hunger with World Food Day on October 16. In honor of the founding date of the Food and Agriculture Organization of the United Nations, people around the world affirm their commitment to eradicating hunger. 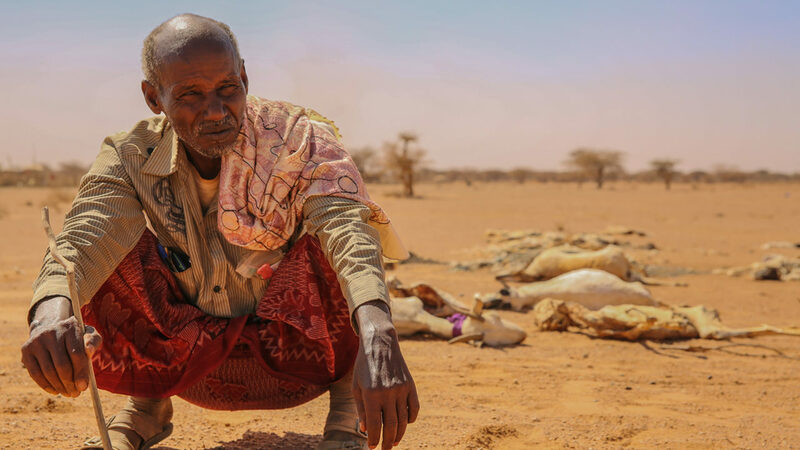 Mornings in Somalia are a struggle for Saîd, who dreads the sight he will inevitably face when walking over to the fields behind his tent: lifeless goats scattered across the ground, infested with maggots and devoured as vultures’ prey. Every week, dozens of farmers’ livestock lose the fight to thirst and hunger, and with it, Saîd’s desperation keeps growing. Somalia is on the brink of yet another famine, and Saîd is one of more than 6 million people at risk. For a country of approximately 11 million, many of them living a nomadic lifestyle, this is devastating. Saîd knows that more than 260,000 people died during 2011’s famine, and he’s worried that Somalia is close to a similar catastrophe. “Right now, we need all the help we can get,” he says. In the past months, thousands of nomads — including Saîd and his family — have been on the move to find what water is left, strapping their tents and empty buckets to the backs of camels and walking for hundreds of miles. But Saîd and his family aren’t finding a better place. Global drought, worsened by conflict and severe food shortages, is affecting as many as 70 million people throughout central, east, and southern Africa, the Middle East, and parts of Asia, says the Famine Early Warning Systems Network. Join us in prayer for people who are hungry around the world and those working to feed them. What’s different now from perhaps any other time in history is that the problem of hunger can be solved. According to the United Nations Food and Agriculture Organization, the world can produce enough to feed everyone on earth. Yet people remain hungry because they don’t have access to the food that exists. Almighty God, it is difficult to see children suffer, especially from hunger. We ask You to give them daily bread today (Matthew 6:11) and end their persistent hunger. Provide the food they need to grow and thrive. Pour out Your grace on hungry families, especially parents straining to feed their children despite dwindling resources. Pray for the millions of people struggling from famine and food shortages. In Ethiopia, Kenya, South Sudan, and Somalia alone, tens of thousands of children could starve to death as famine, starvation, and food and water shortages affect 22 million people. 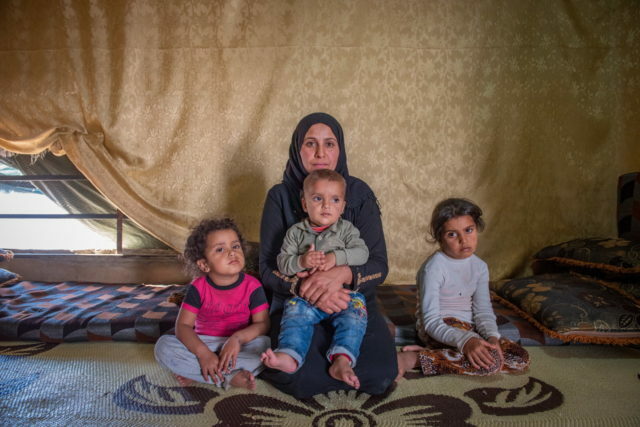 World Vision is scaling up humanitarian assistance here to meet the health, nutrition, child protection, livelihoods, shelter, education, and water and sanitation needs of the most vulnerable. Ask God to begin healing these battered areas of the world. Good Shepherd, we pray for cooperation and support for life-saving assistance to people struggling from food insecurity around the world. Send life-giving rains at just the right time, create good conditions for families to grow food for their survival, and cease conflict so Your children will no longer go to bed hungry and afraid each night. Pray for children affected by acute and chronic malnutrition. 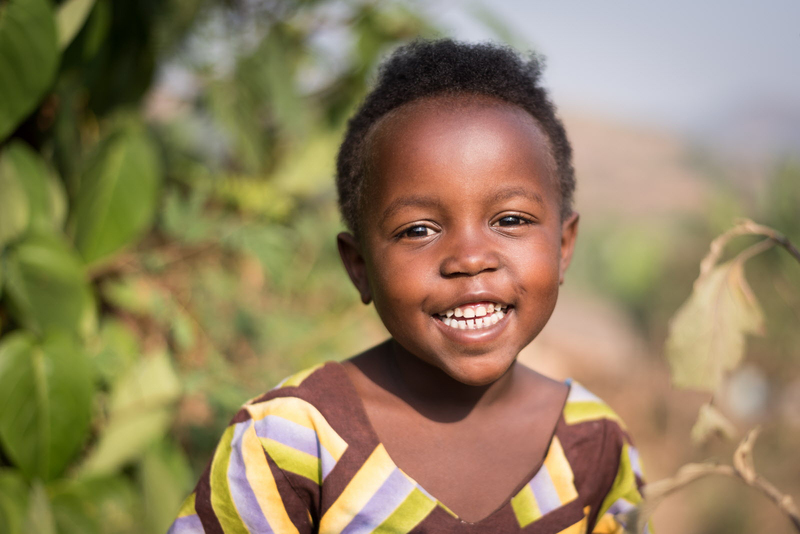 Worldwide, one in four children younger than 5 does not get the nutrition he or she needs. Hunger affects everything from intellectual development to physical growth and ability to fight off illness. Without proper nutrition, a child’s heart literally shrinks. In cases of acute hunger, the liver, kidneys, and intestines begin breaking down. Ask God to intervene. Great Physician, we don’t have words to express how much this breaks our hearts. Have mercy on these children. Protect their little bodies and give them strength. Put Your healing hand on those with developmental issues, and allow them to grow up strong and healthy despite the hunger that afflicts them. About 66 million children around the world — 23 million in Africa alone — attend school hungry. This makes concentrating on subjects difficult, and their learning suffers. Heavenly Father, be with little ones as they seek to learn. Provide their parents with the means to send them to school well fed so the only hunger they know is an insatiable hunger to learn. Equip them with an education that prepares them to do the great things You have planned for their lives. Pray for World Vision’s work to feed the hungry. 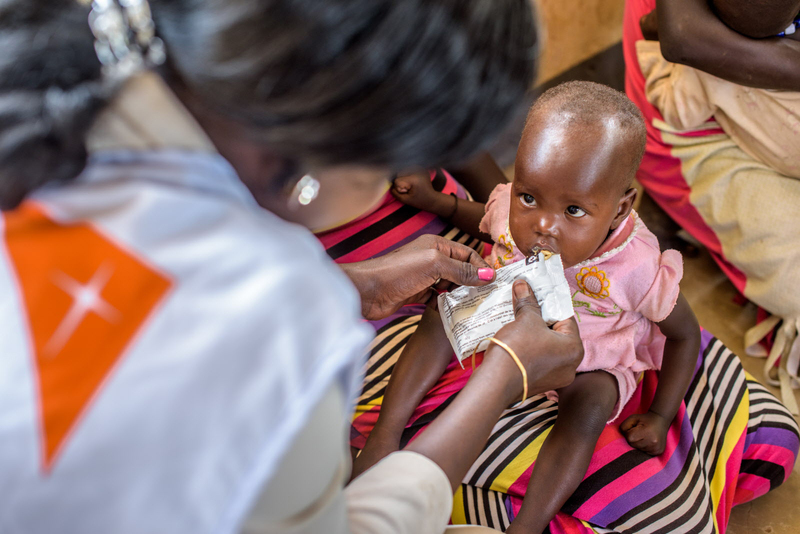 World Vision, the largest distributor of World Food Program food aid, continues to be at the forefront of feeding millions of hungry families. 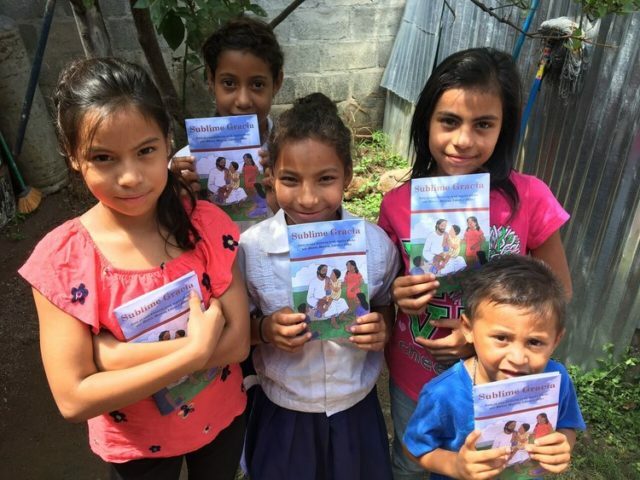 We work with children, families, and communities around the world to provide nutritional relief in the short term and improved agricultural programs and training in the long term. Loving Provider, Isaiah 58:10 tells us that if we give ourselves on behalf of the hungry, then our light will shine in the dark. Thank You for those who are shining lights, and please call forth others to make a difference. Be a fortress against danger for World Vision’s staff who work in Your name to feed the hungry. Continue to use relief workers to bring not only much-needed food but to also show Your love so people can be fed spiritually and physically. Despite tragedies, progress is being made. The number of hungry people globally has fallen by 167 million in the last decade despite a surge in population growth, according to the Food and Agriculture Organization. Great Deliverer, we thank You for the precious lives that have been saved. 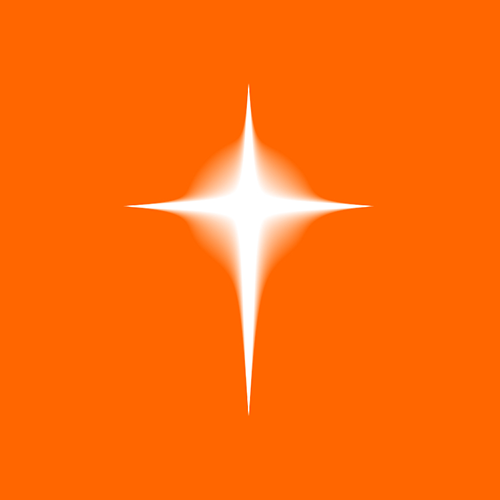 May Your love guide our steps as we continue on the path to eradicating hunger. Pray for people to discover the Bread of life. World Vision rejoices with the progress made toward eradicating hunger, but we “do not live by bread alone” (Matthew 4:4, NLT). Many people still live without faith and hope. Thank You Lord for being our Bread of life — the One who satisfies our soul’s deepest desire with the joy of salvation. Open people’s eyes to recognize You as the only Bread of life for their spiritual hunger. Contributors: Stefanie Glinski and Kristy J. O’Hara, World Vision staff. One in eight people in the developing world does not have enough to eat. That’s why World Vision partners with communities to address immediate food needs and grow sustainable food for the future.